The agency is billed for incurred expenditures on a monthly basis unless otherwise specified in the award. 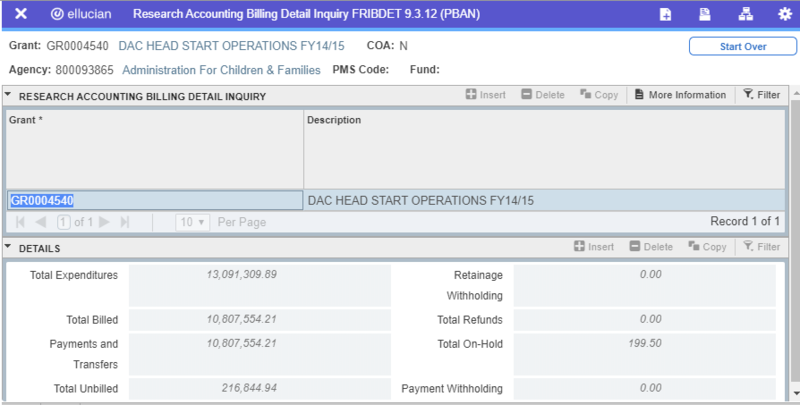 The Grant Events Assignment form FRAEVGA is utilized to set up recurring events for invoicing and reporting purposes. This form includes the invoice/report format (letterhead, agency form, etc. ), billing/reporting frequency (monthly, quarterly, etc.) and any specific instructions or requirements.Invoices are prepared in accordance with standardized invoicing and contractual requirements, and all applicable federal, state and University policies and procedures. Several federal agencies utilize an on-line centralized payment system. These types of billings are called Letter of Credit (LOC) draws. Only compliant expenditures within award terms and budget will be invoiced. They are reconciled to official accounting records and certified by designated personnel. Research Accounting Billing Detail Inquiry form FRIBDET allows the research center/department to see which expenses have been billed each month (cost reimbursable awards only), billed dollar amounts, agency payments received, unbilled expenditures pending invoicing, and any expenses placed on hold that are non-compliant and cannot be billed.